Stained with Magic :: Character Reveal: Gato Akio! The above character is concept art and only reflects the final product to a limited extent. Retired soldier, gang leader, art lover, killer. Gato Akio, a veteran of the Euro Zone War. Leading Japanese rescue efforts to save civilians from war-torn Europe. Gaining augmented limbs via a volunteer program within the Japanese Army in an effort to minimize loss of life. 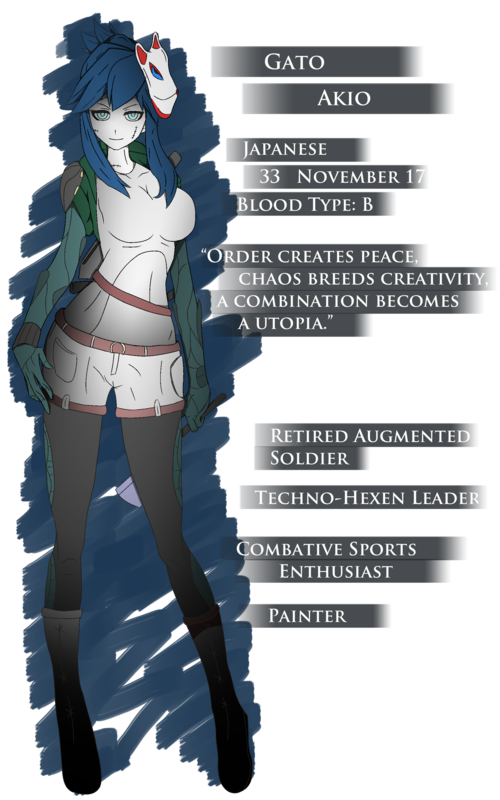 Now retired, Akio has fallen into the world of Technohexen gangs with old squad mates. Despite upholding a job as security counsel for the Sei Group’s CEO. What can her friends tell you about her? Passionate but deadly.